I’ll just admit it. I’m having way too much fun with blogging right now, even with as few postings as I’ve done so far. I’ve spent a great deal of my adult life writing, but it was never the kind of writing that anyone outside of a hospital, government agency, or law office would ever get to read, and always absolutely devoid of imagination. Being able to write about whatever I want, in whatever format pleases me is a nice change. 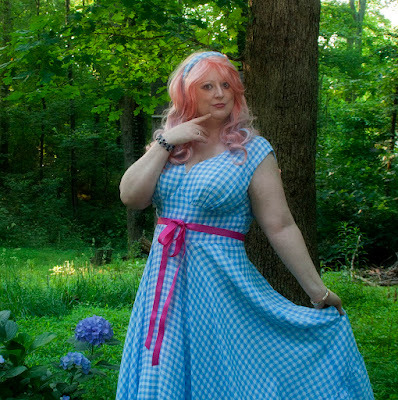 As a bonus, you can also find info on her inspiration for this incredibly cute gingham dress, which I would totally wear, especially if I had a pink wig.